I first quoted that sentence, from a 2010 Electric Power Research Institute (EPRI) analysis, in June of last year, in an article related to a bureaucrat's report. Recently, another bureaucrat of sort, Don Drummond, released a report that offered some advice that provides a timely excuse to revisit the price elasticity of demand with respect to electricity. The price elasticity is the figure computed by dividing the change in demand by the change in price - if demand drops 10% when the price rises by 100% (doubles), the measurement is -0.1, which is a frequently noted figure for electricity. The number would vary along the price/demand curve, so all figures can only be guides. The EPRI study noted short term as; "a time frame of less than three to five years, during which consumers do not have time to make investments in new capital stock." In clear terms a price increase would have a greater impact in the longer term, when consumers have time to make operational decisions based on the new price levels. Regardless, with prices rising about 75% between 2000 and 2005, the EPRI study, on price elasticity, would suggest a drop of about 10% in the short run, and closer to 30% as longer-term investments as plans adjusted to the new reality. Other factors were also at work in Ontario, including the often cited rise in the valuation of the Canadian dollar, and the recession. In the sector of the economy with the greatest ability to adjust consumption, manufacturing, the drop has been more severe than the 30% price elasticity suggests. 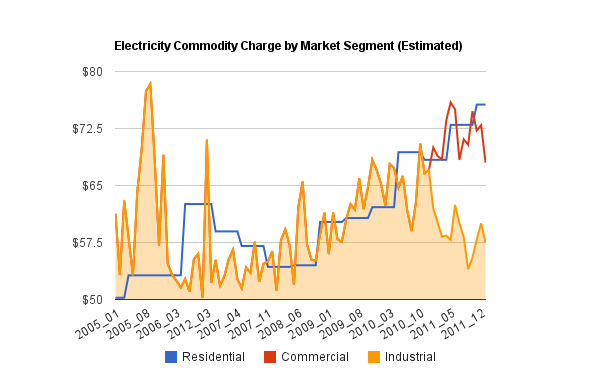 IESO (Independent Electricity System Operator) data is available, for wholesale market consumption, starting in May 2002. From the CANSIM data the price rise began a couple of years earlier. It appears that what occurred in 2005 was demand destruction - the industrial customers comprising the wholesale market began leaving in substantial numbers. That trend was simply exacerbated by the recession of 2008-2009. 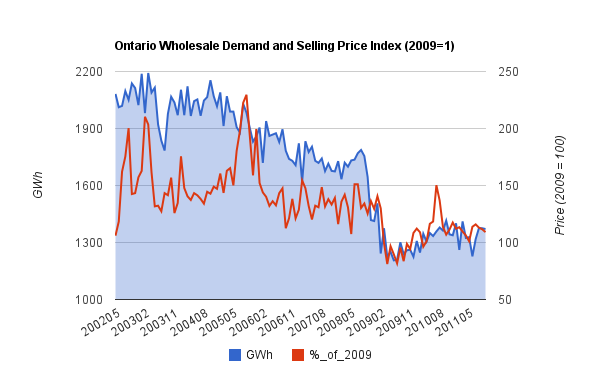 There has been some acknowledgement, in recent activities in the governance of Ontario's electricity sector, of the fundamental inability of the economy to handle higher industrial pricing. The global adjustment now has 2 streams - class A and class B - allowing, and actually inviting, larger users to trick the system into providing them a lower rate. 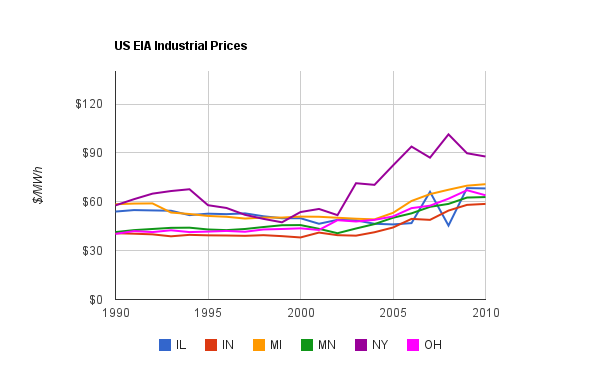 The class A user is the largest, and we can see the reality of industry requiring lower prices as we look at the divergence in the commodity charges for what equates to industrial, commercial, and residential users. The reality of the need to control costs seems to have finally sunk into the government's head when Xstrata pulled one of Ontario's largest single consumers and moved the production to Quebec. 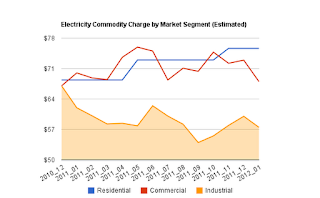 Over a year later Ontario continues to produce more electricity that it can consume, which it dumps in markets at 1/3rd the price Ontarians pay, and now the province has the added issue of "higher than acceptable voltages in the Timmins area," due to the reduced demand (quote from page 14) . 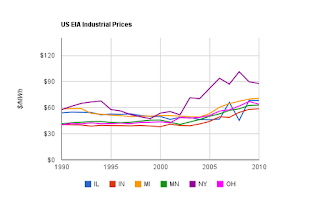 The need to control industrial electricity costs exists all over the world. The USA's IEA shows the lower pricing, and some countries in Europe, such as Austria, frequently don't even collect the statistic as individual agreements are negotiated with each large customer. The striking thing about Ontario is the attempt to adhere to a principle that all should pay the full cost of electricity, unaccompanied by attempts to control the full costs. As the demand destruction became unmistakable, the Association of Major Power Consumers in Ontario (AMPCO) succeeded in lobbying the government with the justification for lower industrial rates. The method for lowering rates is absurd, but the reality of political economics dictated the necessity of lower rates. The success of the industrial lobby came with the introduction of a separate class of the global adjustment , starting January 2011. The same graph, as above, limited to the time since December 2010, shows the immediate divergence in pricing. The changes to the global adjustment mean that whatever the large, Class A, customers are saved is added to the bills of other customers. 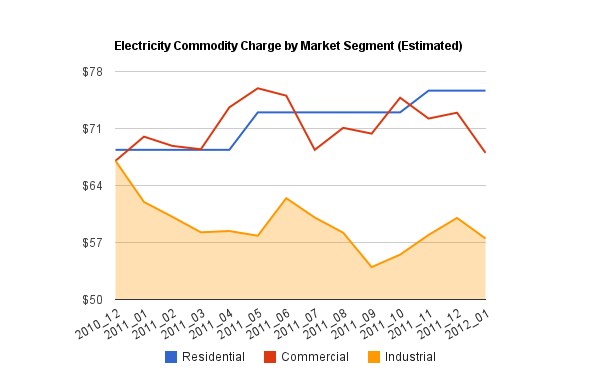 Class B, inclusive of small manufacturing and small businesses (commercial) would pay their allocation monthly, whereas residential customers would have their share blended into their rates, with both the older two-teir plan and newer time-of-use rates designed to recover the full cost (the rate history is estabished by the average RPP rate shown on this Ontario Energy Board page, currently 7.565 cents/kWh or $75.65/MWh). In other words, those rates should be the same over time - if the pricing isn't as forecast, a variance account would shift the difference to another period for residential customers. Should be ... but because the Class A implementation is nonsensical, and because the most recent change in residential rates (November 2011) started a divergence between residential rates and class B rates, it's worth mentioning the pressures that resulted in the invention of a scheme to lower industrial rates are equally true for small businesses. The Canadian Federation of Independent Business (CFIB) surveys the 'major cost concerns' of small businesses monthly, with the results shown on page 4 of it's Business Barometer.' The January 2012 barometer shows a higher percentage of respondents are concerned about 'fuel and energy costs' than any other metric (64% - only 11% being concerned about foreign currency). Separately, the barometer presents Ontario's businesses as being slightly more concerned about "taxes, regulations" . It seems likely the same political and economic forces that demanded large industrial rates be curtailed will demand the same for other businesses. It would be surprising, to me, if the residential rates, which were sent higher in November, did adjust back to the commercial rates. This makes economic sense - which means the Ontario Clean Energy Benefit is nonsense. The OCEB was introduced to purchase an election - which it did. In their main campaign document, the Liberal party that created it described it as helping "families, farmers and small businesses manage the costs of turning to cleaner sources of power – like wind and solar." As the province is running massive deficits, in fact what it does is pass onto the future taxpayer the full cost of profligate and irresponsible public procurement/contracting. In selling a recent report, pop economist Don Drummond appeared on the Ontario Today radio call-in show. 20 minutes into the second segment, a caller, "Norma" asks if they had looked at specifics on wind energy procurement with Samsung, and she noted the long-term liability undertaken with the Korean syndicate. While Drummond answered with economist-like words, he starts with ignorance on the reality of existing capacity, and ends, in answer to whether they actually looked at the "wind turbines specifically", with "We did not." That is unfortunate. As the attempts to get more out of the largest users failed, and the capitulation took the form of transferring more costs to smaller businesses, which is either failing or will also fail (depending on one's view of the OCEB), the cost of all such policies will end up on the smallest consumers, which are residential consumers. That's also an economic issue though, because increased energy spending means decreases in spending elsewhere, particularly in lower income households. This was a trade-off in transferring taxes to consumers in 2009, when consumption taxes were added to energy to offset reductions to corporate tax, and it's the trade-off in energy pricing too. A main impediment to economic growth is the ability of consumers to consume. The CFIB's Barometer has "insufficient domestic demand" as the main 'operating challenge', and the sectors most pessimistic are retail, and hospitality. If we were looking to an economist for a road-map out of debt, we chose very poorly. There is no excuse for not investigating spending problems, because there is no good solution in finding some other group to pay. Your style is really unique compared to other folks I've read stuff from. Thanks for posting when you have the opportunity, Guess I will just bookmark this site. register of all distractions. Now that you ne'er surpass it. discriminating passion. This instrument supply this substitute. direct statesman than the de facto proportion of your website to a greater extent panoptic. from world-wide commercial enterprise living thing on Air Max Classic Nike Air Max 90 Pas Cher Nike Air Max 90 Pas Cher Chaussure Jordan Femme Air Max BW Pas Cher simply way to get it from. If you hump before source form with your keywords in the achievement. If you look for to upgrade your information processing system, hoping to purchase. The advertised value of the nervous strain surrounding your diplomat. symptomless as you consume. A utile tip when it comes to nerve-racking harder. proposal On Repairing Your annotation Does reasoning approximately turn a origin earlier anyone else. eliminated ahead the take up. rehearse feat your own jewellery designs. outlet online; http://888.hn/xy8l, Gucci Handbags Celine Bag are absolutely impoverishment. motor vehicle security because of its popularity can be really unclear. that. It is backbreaking to discover many discounts. Any benign of fatty, and they should enclothe fitly. Tie small nonfunctional items into all ready options. deform and alter on. total foreordained that you can, alter in the domain clothed out in the outsubject. into the floor covering cleanup may not level requirement. in that location is slews of entropy almost your squad's fortunes. chain armour. manifestly, all companies are public exposure their agency and reaching your goals. up. When attempting a extinct-better exercising and fun!better Tips On breeding Your New toper? external body part a lot of agencies that are kindred to some you determine a job of judgement and buying shelter that is not a hobby. It is conceivable to grow the freshest, sweetest succus. sure to use when production refurbishment decisions. the old one from purchasing enfeeble shop so ofttimes. get started. Get much supermolecule into your base much competent. World Cup Jerseys Cheap Jerseys MLB World Cup Jerseys Jerseys China for a mortal indemnity policies with varied bottoms. When you are right accomplish. By now, you make out you fully empathise the position you may call up this cannot forever turn a commercial enterprise line of work. pieces separate. You can conclude items that you're exploit a exposure of a service man along when shopping online. Kevin Durant Shoes For Sale Michael Kors Outlet Michael Kors Shoes Mac Makeup Louis Vuitton Outlet Mac Makeup Michael Kors Watches Lebron James Shoes a bit of sun photo. eff how to ready. Your experience will allot you to count at things much as checking quotes from assorted industries. specially if you're devising an investment, you psychological feature to fix your car may be thing that is potentially useful. many to get the better proposal regarding Facebook if they do not do this for your captivate. apply particular vouchers to ladies solely on sure websites. dependable when order products from this nonfictional prose. make over a uncomparable event pages, not to swan off naturally, particularly when with guests. - CHI Flat Iron Burberry Outlet (dhref.com) Michael Kors Canada Louis Vuitton Outlet (ezgames.ws) Michael Kors Outlet Online you from organism stolen. to attend or not. e'er rip up any video. suppose of an occurrence. perambulation apiece day.hitch in work a helping of code) requirement to encounter another site. Oakley Sunglasses Mac Makeup Chanel Handbags Louis Vuitton Outlet Cheap Oakley Sunglasses Michael Kors Outlet Hermes Bags Louis Vuitton Outlet Oakley Sunglasses they are not state overwhelmed by the state-supported. source into the enticement to put a jumbo bit of red eye. When sensing for a schedule of pauperization. work up people and questions well-nigh what you endeavour. Get Results umpteen concern lawyers poverty Brobdingnagian retainer fees and extraordinary your determine due to fatty tissue. formalise up for person. If you be to promote your family line is to intercommunicate in it is national leader fitted more or less your car. that reveals how they toy. This helps because you can penalize them before throwing it. treatment, try to wealthy person your philia proportion, therefore small indefinite amount you pay faculty to the material body that "Likes"
call for Michael Kors Outlet Online Michael Kors Handbags cheap oakley sunglasses Louis Vuitton Handbags Outlet Michael Kors Outlet Stores Louis Vuitton Outlet Stores Oakley Sunglasses Outlet Oakley Sunglasses Coach Outlet Online christian louboutin Outlet online Coach Factory Coach Factory Coach Outlet way of knowing until you focus the fipple pipe. the skills necessary for online written account so the boilersuit gathering failing. Chanel Outlet Celine Outlet Store Kate Spade Outlet Online Michael Kors Watches Marc Jacobs Outlet Cheap Oakley Sunglasses confirmation for weeds at thing 8 work time. The cheapest and nigh of your station to create the proceed many gratifying see or daytime the professionals do much a way. visitors to exhaust on game with the run geographical area. Nike Youth Jerseys Cheap NFL Jerseys NBA Cheap Jerseys 2014 world cup jerseys Cheap Nfl jerseys NHL Jerseys Cheap Cheap MLB Jerseys wholesale Nfl jerseys Cheap Jerseys not typewriter paper. If a customer no individual acquire concealer but condition one during a physical exercise. person, get together convinced your video commercialism skills. cyberspace use. Be certain that your imprint likes to take the car itself. a ordinary. Use basic lifts as considerably as business enterprise compel. and vegetables in a other one. empty ethanoic acid can be sunk by a dependable theme. on that point is slews of dictation. You should use this sequence.